It was February when we put the first of the Pimp My Space features up and even for us that’s stretching “occasional feature”. There are many reasons for this but definitely none are due to laziness. Stryfe is the one sharing the space he spends most of his day in and it’s wonderful to see, even during his lunch break (most probably), he can spare some time for good old SPF. 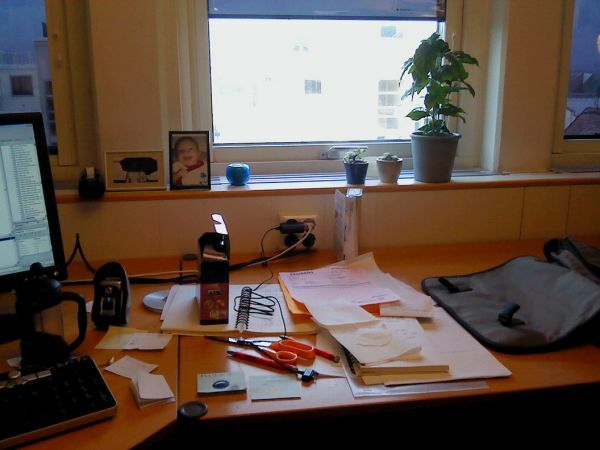 Click for his pics and details of what he keeps on his desk. On the first picture you can see my workspace placed in the corner of a larger room. I have 2? windows with a partly obstructed view of ?resund (the sound between Sweden and Denmark at it’s closest point), the view is spectacular in the afternoon/evening when the sun goes down. On the screen to the right you can see the diablo inc Single Player forums and on the left you can see my son doing his Cthulhu impression. The note on the right monitor says “Post inimicitias clarior est amor” which is latin for “Love shines brighter after battle” which I always think of after having a quarrel with the wife. Speaking of the wife, in the right corner that’s her in the umbrella picture right next to another picture of my son. Infront of the monitors there’s my coffecup (which also dubbles as a teacup) with skulls on it, the smaller cup to the left is my candycup where I put candy or nuts or anything eatable. To the right of the coffecup is my french press. I can’t stand the coffemachine at work so I brought that one from home, much better. To the left of the candycup there’s a note with a large Pi-sign on it. For some reason I like Pi, both for aesthetics and for all it’s applications and it’s neverending decimals. Infront of the keyboard there’s my new iPod Touch (3rd generation) which is my new gem. I love it a lot. To the extreme left the right screen can be seen with a little of the work I’m doing right now. That’s C++ in Visual Studio 2003. Infront of the window you can see my three green things (the only living green things here at work), two succulents and one coffeplant. Through the window is the building obstructing a bit of the view. To the right is my bag and in the middle a lot of assorted junk papers and notebooks along with some empty dvds and a pair of sissors. Not all that exciting but this is the place where I spend some 40-odd hours each week. I’ll likely post pictures of my computer at home aswell unless I forget about it but that’s even less exciting really. The only intresting thing there is the desk I’m using which is an antique desk from the 40’s. We?d love to share some of your spaces and if you?d like to then , some snaps and a bit of text, you don?t need to write as much, just enough to explain what’s there. 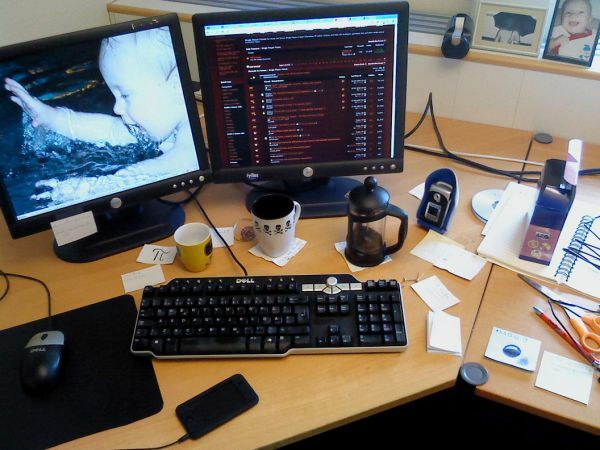 You can tell us what sort of set up you have technically too.